Calling all Indiana drivers: Sorg CDJR is thrilled to announce the appearance of the all-new 2017 Jeep Cherokee, which takes an already legendary vehicle and develops it in a previously unimaginable ways. Not only will the new Cherokee provide stellar engine power and performance specs, but it also promises to give you access to a wealth of exciting technologies as well as a lavishly designed interior. 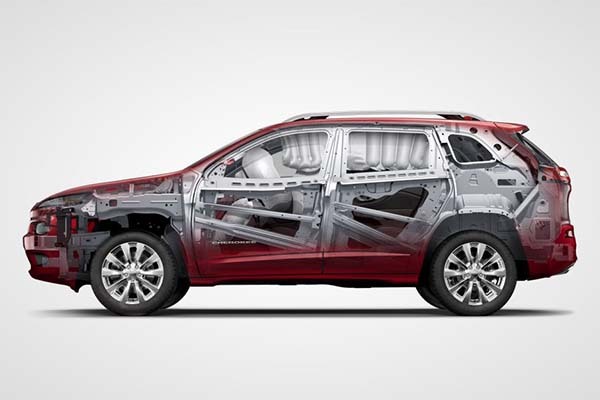 At the same time, the Jeep Cherokee is impressively safe, being outfitted with a wide range of protective systems and safety devices to keep you and all your passengers as secure as possible. Join us in exploring this new SUV in more depth by reading on. Though it’s difficult to narrow down a list of the most exciting performance specs, we want to draw your attention to six in particular: (1) engine power; (2) fuel economy; (3) the Cherokee’s 4×4 option; (4) its towing capacity; (5) its transmission system; and (6) its powerful electric steering program. First of all, you’ll get a choice of two engines. On the one hand, you could go for a 2.4L I4 MultiAir engine that gets 184 hp as well as 171 lb-ft of torque. 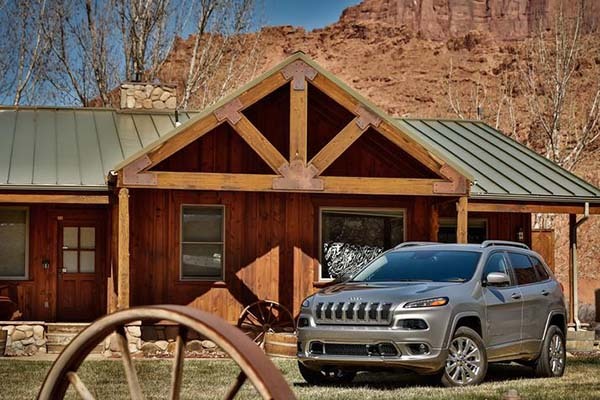 When so outfitted, you’ll be able to trust the Cherokee to reliably transport you to whatever destination you’re aiming for while also packing a bit of a punch on the highway, too. On the other hand, you can opt for a 3.2L V6 24-Valve VVT engine with Electric Stop Start capabilities. Not only does this engine promise you a huge amount of extra power—for example, it generates 271 hp as well as 239 lb-ft of torque—but it also possesses the Start Stop technology to put it to responsible use. 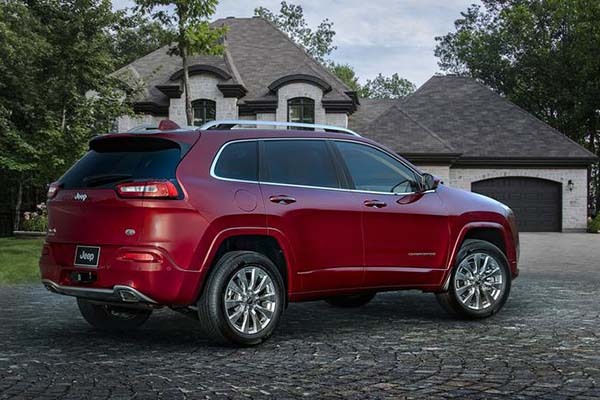 Often, when a vehicle boasts mega-power, as the Cherokee does, it sacrifices efficiency. Not so in this newest Jeep SUV. While efficiency rates vary depending on your trim, you can rest assured that you’re going to be able to expect impressive fuel economy. Upper-level trims, for example, deliver as much as 31 mpg on the highway, even while they can also achieve as much as 489 highway miles on a single tank of gas. 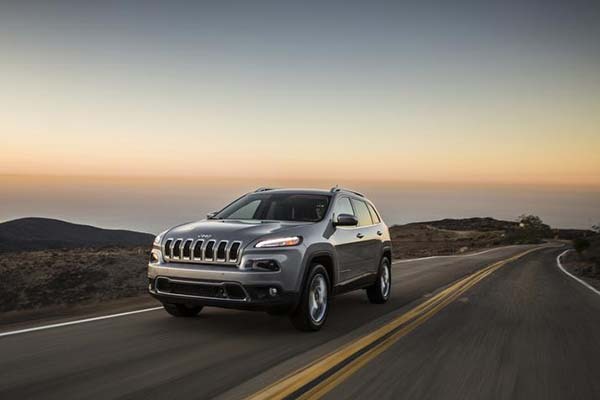 Additionally, with the Cherokee’s Start-Stop technology, you’ll be able to control the amount of CO2 the vehicle outputs, thus ensuring you an even cleaner drive than ever. What else? How about the Cherokee’s drivetrain options. Interested drivers can select a Two-Wheel-Drive option that promises solid control and dynamic power, but you can also go for 4×4 in each of the trims. What this means is that you’ll be able to off-road in this massive vehicle with no trouble, making your next country-side drive or trip up to the Dunes more fun than ever. Just trust in the Cherokee’s expertly designed 4×4 system to channel all the power at this formidable vehicle’s disposal to each of its four wheels. One of the consequences of the Cherokee’s marriage of powerful engines and 4×4 drivetrains is its astonishing towing capacity. As with efficiency levels, the SUV’s towing power varies according to the trim you choose and the drivetrain you select. However, you’ll be getting as much as 4,500 pounds in total when you also choose to outfit certain trims with an optional Trailer Tow Group package. With so much power, you’re never going to have to worry about whether your Cherokee can handle the load it’s give: whether you’re pulling a boat up to the lake shore or a trailer downstate, the Cherokee has got you covered. 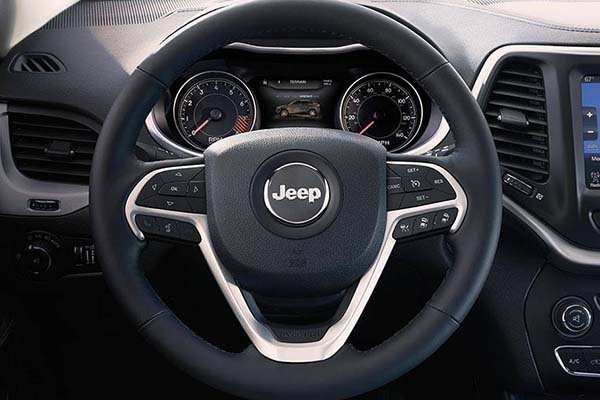 Add to all this the Jeep Cherokee’s stunning 9-speed shiftable transmission system. 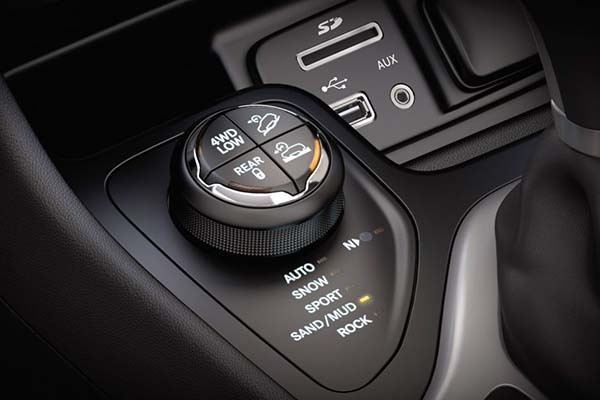 While most vehicles only offer a few speeds, the fact that the Cherokee puts so many options at your fingertips (or toe tips, as the case may be) allows you to maximize efficiency and broaden your control over your drive. For example, 9-speed transmission makes it possible to generate extra mpgs, while it also improves the car’s acceleration enormously. It’s even small enough to take up the same amount of space in the hood as a 6-speed transmission system. 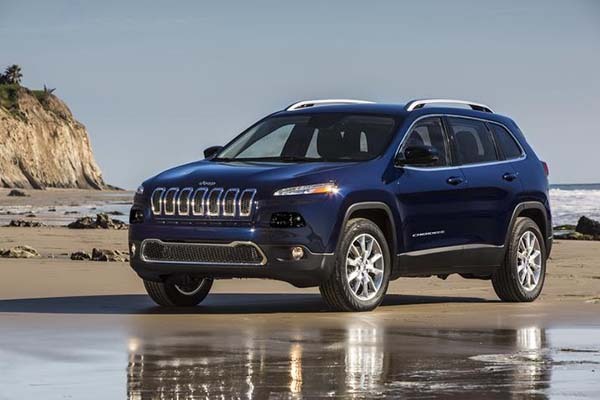 Finally, the Cherokee gives you a super-sensitive electric power steering system that decreases the amount of effort required to put into turning the wheel in order to make driving this SUV easier than ever. 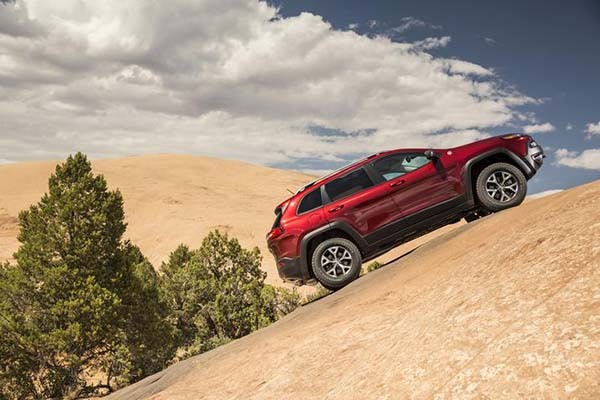 Using specially designed electric mechanisms, the Jeep Cherokee’s power steering system allows you to turn the wheel more easily than ever, even while it cuts down on mpgs by jettisoning the heavier hydraulic system. Now let’s turn from engine power and performance specs to interior design and smart technologies. 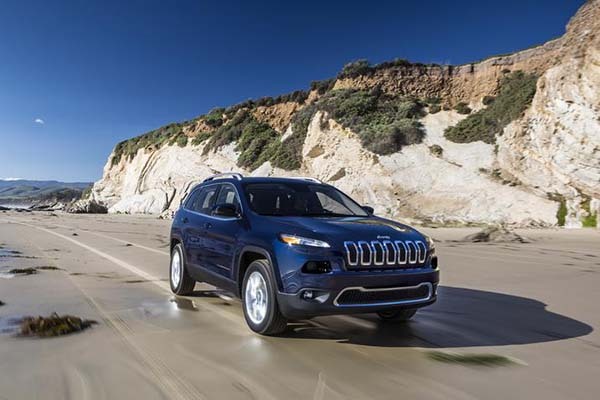 Just as the new Jeep Cherokee provides an array of cutting-edge devices to enhance its performance, so does it boast space-age technologies to keep you connected, informed, and entertained, while also providing a comfortable, spacious cabin. In particular, you’ll get (1) a choice of two different audio systems; (2) USB inputs; (3) a sophisticated UConnect 8.4 Navigation system; (4) a single-disc remote CD player; (5) lavishly designed seating; and (6) generous room to stretch out. Where better to begin than with this impressive SUV’s powerful sound system? In fact, you’re going to have two options: you can either go for the 6-speaker audio device, which in addition to its crisp, clean sound and solid bass also comes with 12 months of satellite radio service. Or you can upgrade to a system that delivers 9 amplified speakers with an optional subwoofer as well. In both cases, you’re going to be able to relish your drives this fall as you enjoy some of the finest audio available. At the same time, this SUV keeps you and your passengers connected throughout the drive with its USB connection plugs. Banish all fears of running out of charge on your smartphone: simply plug your mobile device into the vehicle’s recharging stations, and you’ll be able to stay powered-up no matter how long the drive, meaning that you’ll be able to continue texting, streaming videos, accessing your music, listening to podcasts, and more simply using your own phone. 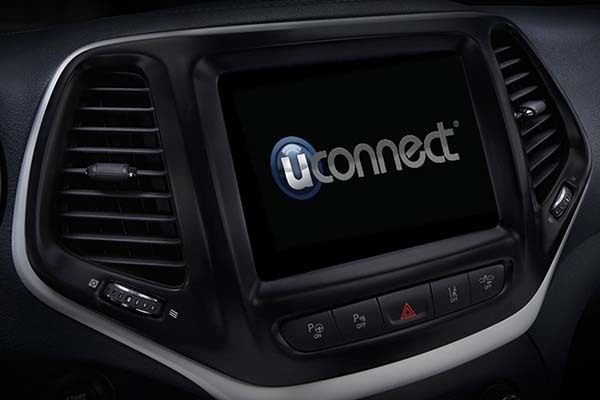 Few things about the Jeep Cherokee are as exciting as its sophisticated UConnect 8.4 NAV device, which keeps you informed of all relevant travel and traffic-related information throughout the drive. Using its gorgeous 8.4 inch touchscreen, you’ll be able to gather information about traffic jams, destination information, route maps, and other travel-related data, plus you’ll be able to use the screen to operate a number of other programs as well. 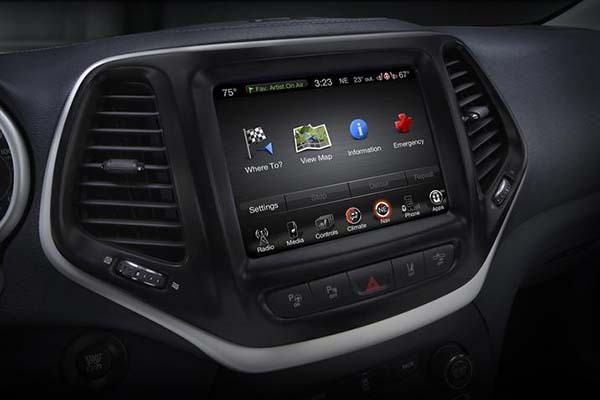 Thus, with a simple swipe of the finger, you’ll have an abundance of information at your fingertips in the new Jeep Cherokee. As if all this wasn’t enough, the Jeep Cherokee also provides a single disc remote CD player in addition to its satellite radio package and its other music options. Break out those old mixed CDs and enjoy a surge of nostalgia as you make use of your older music in this carefully placed and vertically aligned CD player. 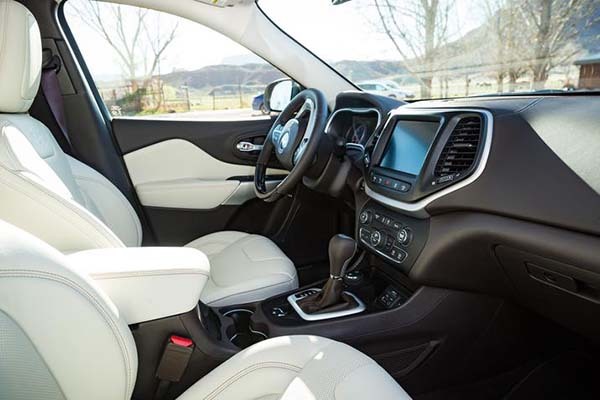 In addition to this spectrum of technologies, though, the Cherokee also offers up a comfortably accoutered interior. For example, you’ll get some of the best-designed seats around. 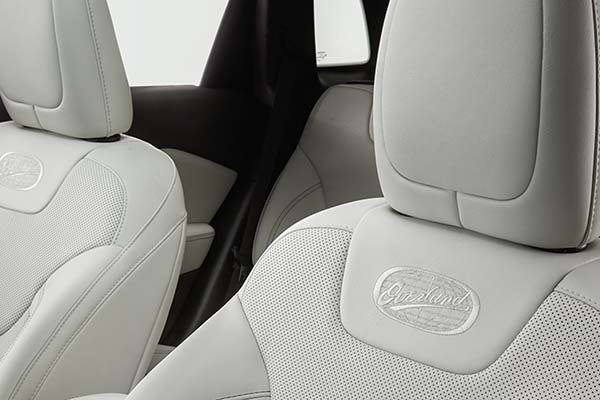 Rear passenger seats can be decked out in premium leather and come ventilated, and their height can be adjusted easily. 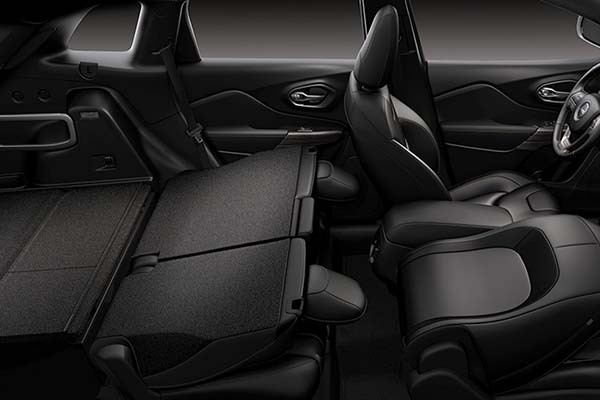 Similarly, all passenger seats can also be outfitted with a multi-level heating system to make your family’s drive even more relaxing. Meanwhile, the driver’s seat boasts power adjustable lumbar support and 8-way power. Not only is the Cherokee’s cabin lavishly designed, but it’s also spacious, offering you and your passengers seating for five. At the same time, though, you’ll be abel to stretch out and really enjoy those long drives in comfort. For example, the Cherokee gives you 39.4 inches of head room, 41.1 inches of legroom, and 53.8 inches of hip room in the front, while also affording 38.5 inches of head room and 40.3 inches of legroom in the back. Likewise, you’ll get 24.6 cubic feet of cargo capacity when all seats are in place, and as much as 54.9 cubic feet when they’re folded down. Last but not least, the Cherokee also comes outfitted with a raft of safety devices to keep you and your passengers as safe as possible on the open road. These include—but of course are not limited to—(1) a swathe of airbags; (2) stability and traction control; (3) a Tire Pressure Monitoring System; (4) a Post-Collision device; (5) Front/Fog Driving Lights; and (6) a Rear View Camera. The Cherokee’s airbag system gathers together a number of benefits. For example, you’ll get front and rear head airbags, dual front side-mounted airbags, and child seat anchors as well. But the Cherokee also boasts a carefully designed passenger airbag occupant sensing deactivation device, which is able to determine the absence of occupants in the cabin and deactivate airbags when necessary, saving you any trouble in minor collisions not involving any passengers. 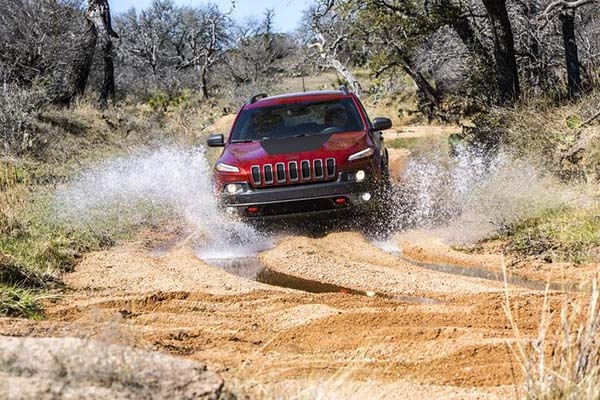 Meanwhile, the Cherokee is designed for highway driving in treacherous conditions, offering you both Stability and Traction Control systems. The first is able to maintain your vehicle’s stability when you’re hurtling down the highway and taking curves at high speeds, while the second is especially suited to winter driving and those sometimes dangerous summer storm conditions that Indiana drivers know so well. Likewise, the Cherokee allows you to keep tabs on the status of your tires with its superb Tire Pressure Monitoring system. 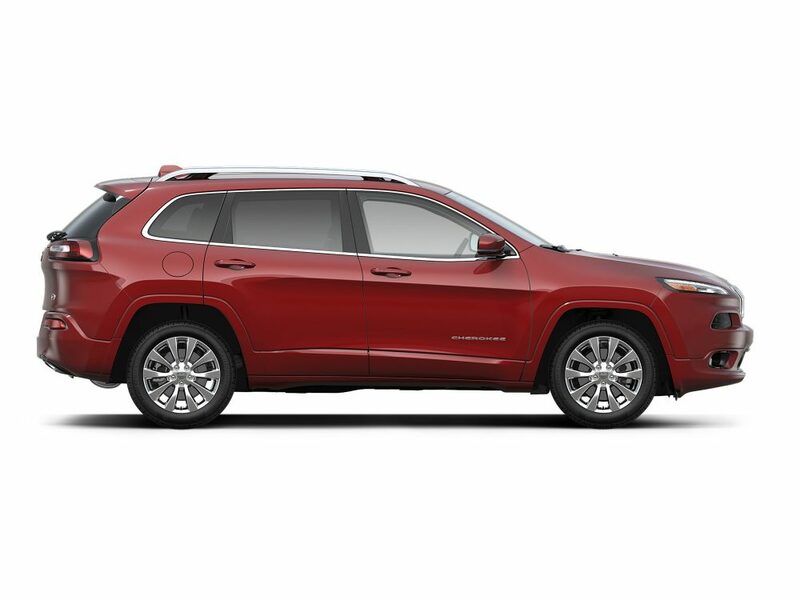 Simply by glancing down at the dash, you’ll be able to identify how much air pressure is in your tires, and you won’t even have to pull over and exit the Cherokee’s cabin to do so. How’s that for added convenience? Sometimes collisions can’t be avoided, and it’s important to have a vehicle that is able to help you respond to accidents. 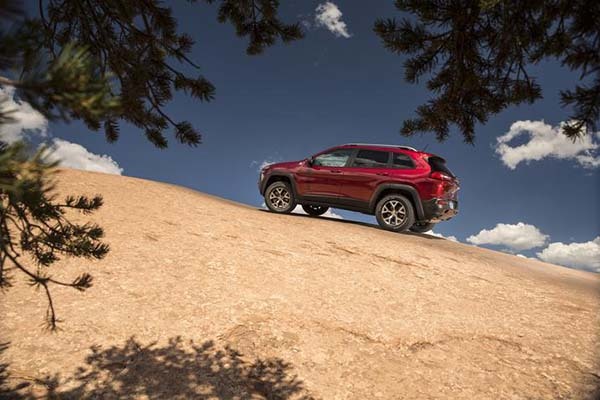 Luckily, the Cherokee offers a Post-Collision Safety System that adds another layer of braking power to the vehicle’s already solid braking system, ensuring that, in the case of a collision, full brake force is applied to prevent any further damage. 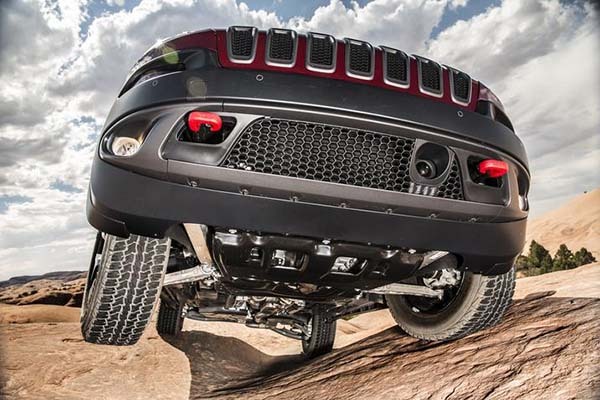 In truth, it’s difficult to know whether to place the Cherokee’s Front/Fog Lights under the category of exterior design or rather safety devices. While on the one hand, these lights add a special allure to the look of your new Cherokee, bathing your vehicle in a soft light during night drives, they are also functional, enabling you to see in those foggy conditions often encountered up near Lake Michigan. 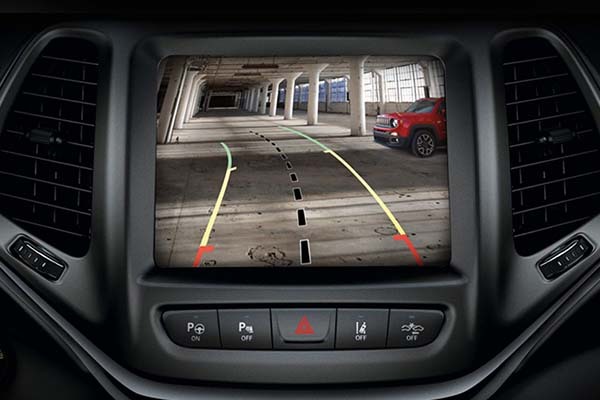 Finally, the Cherokee also gives you a Rear View Camera, which makes backing up as simple as pie, and promises to keep parallel parking a breeze next time you’re in Chicago. By giving you a crystal clear image of the area behind your vehicle, the Rear View Camera enables you to negotiate the tightest spaces with ease.